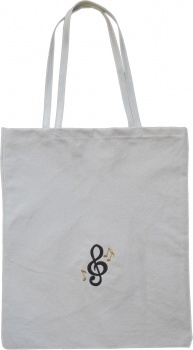 Go to piano lessons and voice lessons in style with this 100% Cotton Canvas Tote Bag. This tote is specifically designed to fit the size of your piano or voice lesson repertoire books. The bag will last for a lifetime because it is made from #10 cotton canvas. #10 cotton canvas is the same material that money bags are made of and is so strong that it is what banks used to transport heavy sackfuls of coins. #10 cotton canvas is what automobile covers are made of. The stitching all around the bag is double zig-zag, the same durable stitch you would find in coin bags. To add some musical style to the bag we have adorned it with a black treble clef and two gold musical notes. Whether you get this tote for yourself or a loved one you can be sure this - you are styling and profiling!